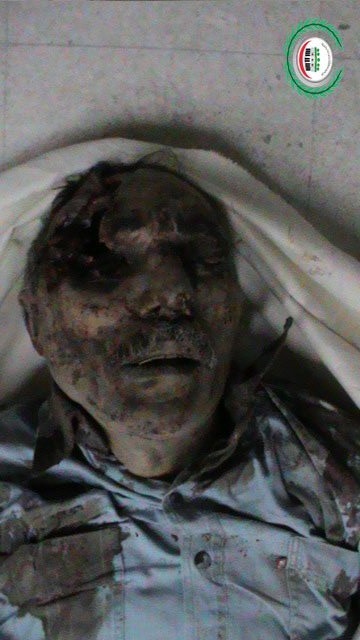 Douma Chemical Massacre: 187 Killed? Three men are shown, older, bearded, and heavyset, sitting beneath a giant Syrian "revolutionary" (French colonial era) flag (on another wall of the giant tent, the same flag, Turkey's flag, and a fist.) Nowhere is there a black flag or anything overtly Islamist. Two men are in the speaking zone, both draped with the same tri-color flag, black band folded under. Both fiddle with prayer beads as they speak. 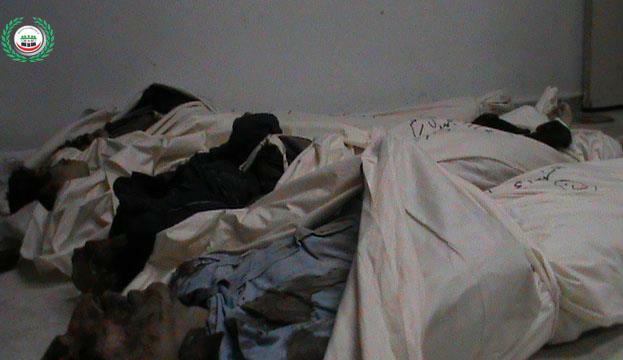 The subject is the Douma chemical massacre a year earlier, after which these men and others left their native area and moved north to other opposition-held areas. The TRT reporter Obaida Hitto notes, as everyone knows, "at least 43 people were killed" in that attack. But he also spoke to this "group of civil society leaders" who had fled and were now in Al-Bab, Aleppo (on the Turkish border) and "they say the death toll in Douma was much higher." I believe I recognize one of the two flag-draped men - an insider with past chemical attacks, running the Douma morgue for victims of the 2013 Ghouta attack. Below, left: Civil Defense Douma Facebook post, linking to this video where he sounds like a preacher, and I heard "Nussayri" - a derogatory term for Alawites). FWIW the unclear hundreds of civilians killed in that event might have all been captives of the ruling militants in Douma, "Army of Islam" (Jaish al-Islam) … He might've been in that group, and/or Civil Defense Douma (pre-White Helmets), even high up, possibly even the only one I could name, General Supervisor: Mohammed Abu Khalid. (I searched a bit and found no quick answer). Anyway, he's the same guy with secret knowledge of the Douma attack years later. He has the same pattern of gray in the beard, but six years wider, apparently the same face otherwise, same clothing style, perhaps the exact same jacket, and a similar position as a leader and death expert in Douma. "After a while we went down into the bunkers and found everyone was dead. I saw it with my own eyes. 187 bodies. We started moving them out so they could be buried." Note: Amin2511 explains the number 187 is not in the spoken audio, where he says, rather, "more than 185." It's the same story, and I doubt Hitto (the reporter) made up the exact number. 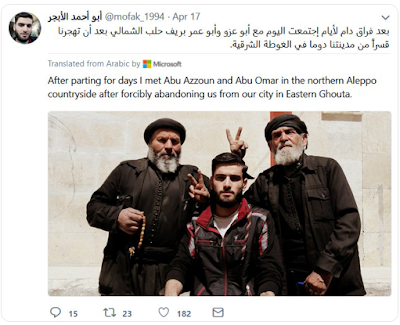 It must have been explained off-camera, perhaps by the Ghouta massacre manager (Abu Azzoun), or presumably, by the man it's attributed to. So I'll continue calling this the Burkhush count, with a grain of salt that size. 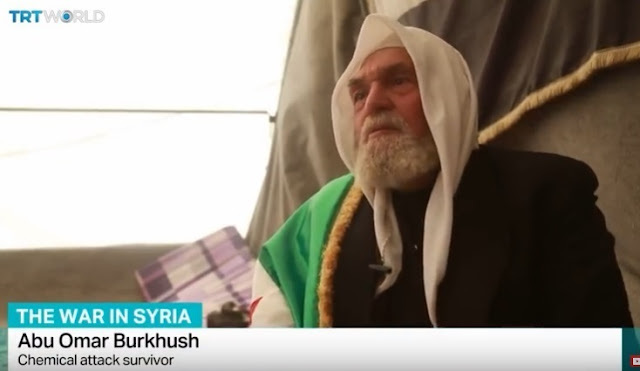 Sheikh Burkhush says he saw this with his own eyes, not anyone else's, and points right at his own eyes as he says it, so as to resolve any confusion. Of course, that means nothing, or suggests he's totally lying (FWIW, he gestures with the left hand, while holding the prayer beads with the right). But in this case, his specificity and his style - and some lingering suspicions of my own - leave me inclined to believe him. Or at least I wouldn't be surprised either way. Did he see and count all 187, or to about 185 before he lost track a bit? Or did he just see enough to credit someone else's count? Wasn't anyone found alive so there was some aspect of rescue to this? He speaks only of finding bodies, and the removal was all about burying them. He doesn't mention, for example, this frantic man claiming to be working at one of these sites, finding and rescuing several living people: Khaled Abu Jaafar told Al-Jazeera he went to help some friends in a basement shelter and found a bad scene: "I went up and down the stairs about three times to help evacuate children from the building." ... By his third frantic dash down the stairs, with a wet piece of cloth over his mouth and a little girl in each arm, everything went dark ... "I lost consciousness." Same death toll hinted at in the first reports! "The specificity is spooky. 187 is a pretty good hard number to put on the final toll SEVERAL people hinted at in the first days before it settled at a lame-seeming 43 dead. For a final act, (Jaish al-Islam) should have aimed for solid triple-digits, well over a hundred, but not pushing too far, and nowhere near that stunt of claiming 1,000 dead all at once. I thought the reports up to app. 200 were going to settle there, and I still suspect they gassed that many and just never phoned it all in." At the time, I bothered to catalog a number of early claims that seemed confident of death tolls and estimates climbing past 100, 150, and topping out at ~180 and ~200 (both sounding rounded). I just dug up and added a few more I missed that zeroed in closer to the new number, with several claiming 190 killed, more than 190 or "nearly 190." It wasn't a bunch of nobodies spreading random rumors, but some of the more influential opposition organs (not the SOHR this time) who were confident in putting forth death tolls well past what was finally accepted. The first level of this was a claim of 70-85 dead and growing, reported so widely some still claim that attack killed 85+. One good source that mentions both these numbers: ""Seventy people suffocated to death and hundreds still suffocating," Raed al-Saleh, head of the White Helmets, told Al Jazeera," while "Abu Jaafar says at least 85 people were killed" ..."
The same and others went on the report specific points along a steady climb to just about the same 187 we hear about now. Civil defense in Douma: death toll "has risen to 150." UOSSM: predicts death toll "well over 100"
Tawfik Chamaa, UOSSM "said 150 people were confirmed dead and the number was growing. “The majority were civilians, women and children trapped in underground shelters,” he said." SAMS/Sahloul: "Latest estimate of death ...is 180 mostly women and Children." (see below) 180 is widely repeated, with many but not all citing this tweet. It stands as the next most common alternate death toll besides 85+, and it tops out only a bit higher. And who were these activists? Al Bawab News: (and hardly anyone else) perhaps rounding up and exaggerating to claim "more than 200." Others have said around 200, etc. No one I noted reported the number creeping any higher. It stopped around 190, before it crashed inexplicably back down to ~43. This is, of course, eerily close to what this "survivor" refers to. And it makes perfect sense strategically, per the thoughts I raised; deep into the hundreds but nowhere near a thousand, not so pushy as to even ask for a two, but getting close, and easily ranking as CW death toll #2 in the whole conflict. Breaking 100 has been elusive, done I think just twice before. They'd want to shatter that usual ceiling with at least 150 dead, and better yet, about 180-190, or just 187. Yes. "The Syrian Civil Defense group [White Helmets] documented 42 fatalities but was impeded from searching further by strong odors that gave rescuers difficulties breathing, said Siraj Mahmoud, a spokesman for the group." By the next day, there was more finality; April 9 everyone agreed there were more than 42 killed, or even more than 43, but no one knew how many more. "due to conflicting reports, and difficulty gathering data," the UOSSM had thought 70 or more died, but then by April 9 decided could only confirm the White Helmets' 42. There would be more, but it seemed unclear how many. 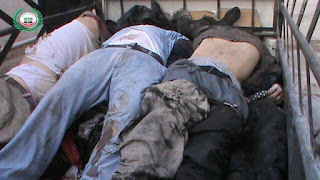 "Updated death toll ...SAMS has verified 43 people killed in the attack, including 35 identified, and 8 unidentified." 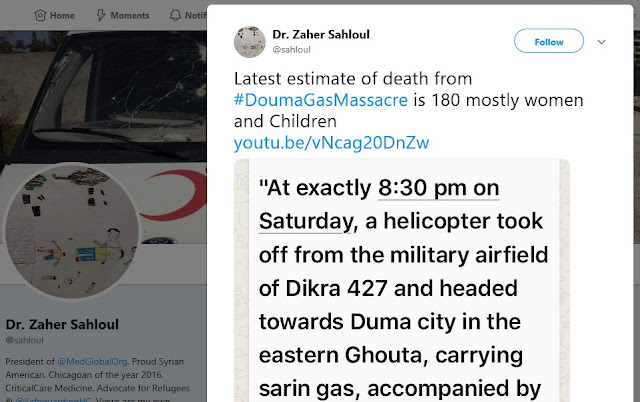 A week later, the Guardian would report (17 April) "Dr Ghanem Tayara, the director of the Union of Medical Care and Relief Organisations (UOSSM) … said he thought the death toll was higher than previous estimates of between 40 and 70. "So those stood as the "estimates" (a common estimate, and the confirmed number), but his specialized knowledge left him betting on those higher numbers, despite the illogical lack of evidence. So everyone agreed their number was low, and more than 43 were killed. But none of them, that I've caught, ever updated to say how many more. The given reason doesn't make sense. How was someone was able to credibly estimate up to 140 deaths that no one could then verify? It's an open mystery. One possibility is the numbers were being handed out by one centralized group controlling the deaths, and they stopped talking at some point, for some reasons we could only guess. That left just the ~43 bodies that appeared, as an incomplete answer to the expectations they had raised, and then just left it that way for the following year. Sahloul and Burkhush on the same script? There's no suggestion of an expected rise, just a more exact count. Was that really just some error? Was he just rounding down the original toll prior to the story change? Abu Omar Burkhush says he didn't just estimate but saw an exact-sounding 187. Also note Sahloul passes on that the attack used sarin, agreeing with the details Burkhush (and many others) reported, rather than chlorine (as accepted). Adding to this: "The medical relief organization Syrian American Medical Society (SAMS) meanwhile also said that a chlorine bomb hit Douma hospital, killing six people, and that a second attack with "mixed agents" including nerve agents had hit a building nearby." And Sahloul was clear that the attack happened at 9:00 (not 7-7:30 as accepted by the OPCW's investigation). His helicopter with the sarin didn't even take off until more than an hour after the now-accepted attack time, at "exactly 8:30 pm." I imagine if he recalled the time, Burkhush would tell you it was at 9pm, maybe exactly then. This estimate was on hand for Sahloul just five hours after the time he claims for the attack (about 7 hours after the accepted time). Burkhush says he saw the 187 bodies right away on entering the basements "after a while" following the attack. These seem like twin reflections of a certain narrative that was put forth but not accepted. All those others cited above seem to have been getting the same updates in a story that was primarily deleted in the end. Who put it forth, who decided to drop it or drop support for it, and why? Back to Abu Omar Burkhush: Claims aside, we've never seen more than (most of) the accepted 43-50 bodies. 35 were claimed at one locale (referred to by OPCW etc. as Location 2), we can verify at least 34 of those, and a few others (at least 2 additional children) are seen along with the 35 at a morgue, to go with the accepted death toll of about 43, maybe 46 or 48. But no one else is shown in situ, where they (allegedly) fell from the airdropped poison, and the total number of them should be about 8, not 150. So we have a problem with all these other alleged bodies: when videos and pictures fail to show them, and claims that briefly accounted for them stop, and settle on only 43-50, the natural conclusion is that useful propaganda claim was a lie. 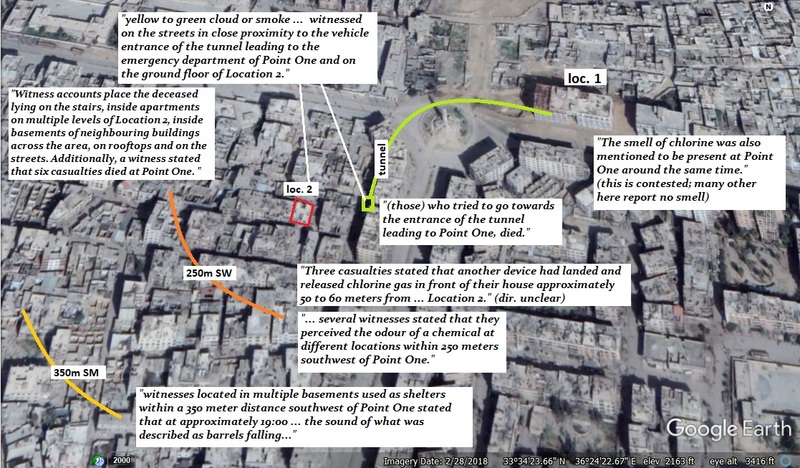 Maybe they died, only to go unseen and unclaimed, if it's in the alleged chemical attack zones in east-central Douma… Only two chlorine bombs were reported, shown, and then examined by the OPCW's Fact Finding Mission (FFM). At the two tested sites (Location 2 and Location 4), there was much to suggest chlorine release, but no sign of sarin, when there would have been if it were released so recently. The FFM also heard about six non-bodies who were taken to Point One for treatment and died there. Let's say there was just one body each in a minimum of two "basements," just one on a roof, one in the street (pres. not at Loc. 2), and six hospital deaths. That's 10 added to the 35, for about the complete reported death toll. But one of each is kind of arbitrary, so a higher death toll is suggested. There's no hint how much higher it might be. It doesn't seem to be an issue they dwelt on much. In that area, one cylinder noted as dropped, all its chlorine pouring down into one building, to supposedly explain the 35 dead there. Some would roll into the street and disperse to nothing on the breeze. Again, this is just chlorine. A stinging eye is the worst it'll cause, up to a block away perhaps, if the wind is right. But then some people told the OPCW's FFM about a whole other chemical bomb no one else reported or showed (that I caught), which landed in front of their own home, just 50-60 meters away from the studied Location 2 (noted on the map above, but direction unclear - somewhere inside the circle marked in orange at 250m from the medical "Point One"). The FFM was never able to check on this, and it sounds probably made-up. But allegedly, there's a third chlorine tank, presumably, and an offered reason why chlorine (by smell) was released in the open. Those witnesses survived, but there should be bodies in a basement or two in this area, since the FFM heard and accepted the claims that the gas could be smelled across the area, and also pooled fatally in whole other basements, albeit "neighbouring" ones, not ones across town. Also it was strong enough to the east as well as to be fatal in the span between the tunnel entrance and the place these bodies were apparently planted after being gassed to death somewhere else. The FFM heard how anyone who went there died, but didn't give a number as to how many found that out and died in that area. I guess that was mentioned in the warnings? "Fatal concentrations predicted by the tunnel entrance. Stay the hell away, folks." Chances are it was a bit different, but not by much, up in Douma, so any gas would (most likely) spread mainly to the northwest or NNW. We need east and/or southwest ... So no, these claims don't map out well. The fair placement for the third bomb, to maximize the chance of it making sense, would be SE of Location 2, so its gas could blow right in the door of Location 2, sink down to the basement, to … even matter since everyone ran to and died on the upper levels … You try to help, but it's no good. Perhaps: the local terrorists released something in the open, from wherever makes sense to explain any claims that are actually true, They might do this to underline their earlier messages to residents: "hide inside, in the basement, away from your windows, and not on the roof either, because of the bombings. Stay out of the street, especially these couple of blocks, and do not witness (in the dark now anyway) these bodies we're going to haul up to Location 2 and start arranging inside." Was it somewhere off the map? Mr. Burkhush mentions bodies only in basements. Maybe he meant primarily, etc. Everyone claims to have been in a basement, sheltering often in big groups, at the time of the attack. It is the logical place to find bodies in an attack with a heavier-than-air gas. But the only bodies we've seen are at location 2, between the 2nd and 1st floors, the stairwell, and on the street just outside the entrance - so maybe one or zero of them could have been in the basement (unless, perhaps, there were more than 35 there, as some claim). These are seen being pulled out around mid-day the morning after, but there's nothing like 187 pulled out of numerous sites, and no bodies removed from any basements. So the scene he describes does not seem to have happened - at least, not in the area of the alleged attack. If he saw this, and again he may have, it was somewhere else, probably off the map of considered locations above. It would be linked by tunnels to the same tunnel opening up next to Location 2. (on the map above, that curve to the medical Point One will also have at least one side-branch somewhere in there, connecting to other tunnels linked to more militarily useful locations. 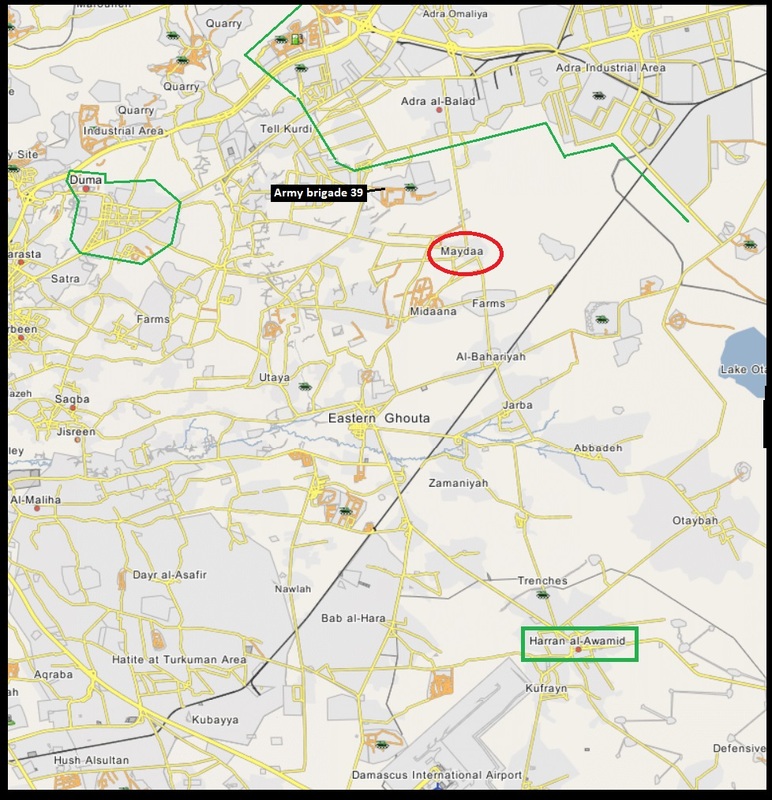 Maybe there's a place just outside Douma (away from prying eyes), maybe some sizable facility operated by Jaish Al-Islam, for the fatal gassing of people they've kidnapped. Seriously. We'll all get this someday, but already I can assure you they must have such a place or places. It might happen in part of a known place like Tawba prison, but I suspect it's somewhere more obscure, like an old factory or a repurposed slaughterhouse, and was probably flattened and torched right after this last job on 7 April, 2018. Such gassing could done there in multiple "bunkers" as sheikh Burkhush says, or just one space, where it's easier to count (or already know) how many there are. He would just say basement shelters, since he knows that's where they're supposed to be found later. The visuals suggest the victims, including women and children, were bound, perhaps upside-down, and fitted with goggles, before they were gassed with a caustic agent that left them coughing up yellow mucous that poured up their faces, staining the skin all around the goggles, but not inside the goggles, where their eyes didn't even turn red. 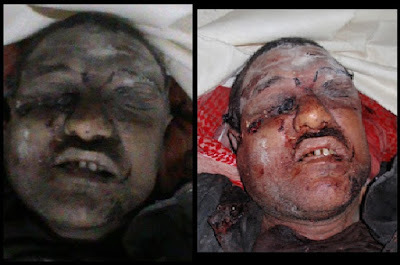 It does sound crazy, but it's the visual reality that brings it up and leaves so few other possibilities... (see Douma's mask of death, part one). It looks wrong, and that's probably why someone washed their faces again just minutes before the first video around 10 PM (so what we see is mainly stains that can't be washed off). This embarrassment might offer the reason the rest of 187 bodies might go unseen - maybe they turned out looking even worse. Andrew's comments under this post on the FFM's final report, bringing up some points I need to brush up on. Andrew: Possible total of people in the 3 basements in that street? Supposedly ~75 in the next door basement and unknown number in the 3rd. But, had the activists another ~150 dead to film, more videos would surely have appeared. The same for the 'hundreds' injured, all from that same area but only a relatively small number are filmed at the nearby main hospital- the obvious place for casualties to go to. If the neighbouring basements were ~100 people, it would also mean quite a large number of potential rescuers/relatives?/people who would surely be concerned about their friends and neighbours next door. Yet at 10pm there doesn't seem to be anyone there but bodies left on the floor, activists and White Helmets. Location 2 basement had (app. 50?) before 35-47 of them died, and a few escaped to tell a story. If they were gassed in another location, it could be multiple "bunkers" as Burkhush says, or just one space, where it's easier to count (or already know) how many there are. He would just say basement shelters, since he knows that's where they're supposed to be found later. I doubt the other basements were ever staffed with the bodies to go with that story, but they were killed, prob. in A basement, and a story went out, but lacked for evidence support and fizzled out. Seems worth reviving it, and then seeing about some follow-up. By chance did you assemble your points on the subject somewhere? I have a love-hate relationship with re-inventing the wheel, but I gotta note the hate ATM. I have too many wheels on the burner, back burners, wheels on fire, you know. CivilDefense Douma (CDD) - the pre-White Helmets friendly non-Islamist rescue guys - overview post - morgue photos + CW signs overview - Among the Assad regime crimes they were forced to respond to and expose was a massacre at the "chemistry barrier/checkpoint" near Adra on January 28, 2013. A CDD image claims to show the 6 bodies piled in a truck: "a new massacre committed by Assad's regime against the six martyrs from the Sons of the city of Douma field executed on barrier chemistry near the city of Adra." 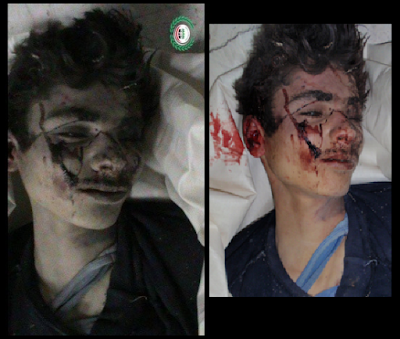 Individual victim photos (below) describe these men and a boy as "Anonymous martyrs At the chemistry barrier on Adra Road." That image is a still from this 54-second video that adds little. Neither spelling pointed to anything labeled nearby on Wikimpaia. But it should be somewhere in this area on the road (prob. not the highway) from Douma to Adra, at a checkpoint perhaps guarding one of the industrial areas, which might produce chemicals. Only later on (below) does a more specific locale emerge: Maydaa/Meda'a, circled in red. It's a bit south of what's suggested, but consistent. It's on the main road liking Adra to Damascus International Airport to the south, and the victims are listed as at least partly from Haran al-Awameed, next to the airport (green box, obviously). This makes Army Brigade 39 a likely (alleged)location of the chemistry checkpoint massacre, but that's still unclear. Also, from the bits I know, LiA or allies were in charge of or active in most towns and roads in this area, having already reported regime chemical attacks on people they probably just killed in Bahariya (south of Maydaa) and in Rihan (under "Army") label) in Nov. 2012, and would claim several men killed by regime sarin in Otaybah (NW of Haran al-Awameed) in March. The logic of it is some locals tried to pass innocently through this checkpoint, where regime thugs refused to let them pass, and in fact murdered them and mutilated them and whatever - then they perhaps dumped the bodies somewhere that activists discovered them pretty swiftly … Or perhaps they know the killing location because rebel fighters found them at the barrier after forcing the thugs out, before the thugs could bury the evidence of their latest routine massacre. Or, of course, the people who found the bodies and/or their militant allies killed these people instead, right at that checkpoint or nowhere near it, for all we can tell. Clues suggest these bodies are neither freshly killed, nor old enough to show much decay. They're probably less than two days dead, and anything unusual won't be due to the body starting to rot. The limpness of the bodies being handled suggests the same - long enough that rigor mortis has faded back away (it's not permanent). The "chemistry" part is intriguing, because the victims might have the signs I'm looking at for a fairly specific kind of chemical murder … as well as the clear marks of conventional weapons, like guns and swords. The related photos and videos seem to show 7 bodies, and at least to start, they're all unidentified, with one apparent teenage boy and the rest being men, tending to look like older men, but then being dead can age a person. ... numbered here Victim 1-7 in order of clarity of their potential chemical signs, except for #7 put last for seeming contested, despite (because of?) being perhaps the clearest case. V1 purple upper head, red-purple livor mortis elsewhere (left face-down), and/or blood-staining, but lips don't appear purple, and that's a key marker for serious cyanosis... eyes: puffed up badly with fluids at one point, then flattened after draining, left flat and wrinkled? some blood coughed up, white residue instead of yellow across upper head (unrelated? Just different mucous, tears, etc? Blood, then mucous, is the most frequent order, and would apply here.) Some crusted blood or a raisin in the inner corner on the right eye, and maybe a fresh burn or wound at its outer corner? Some missing teeth and a fat lip on that same side - tooth still intact at an angle? V2, boy - he's got purple livor mortis, centered in the forehead, closer to his vertical hair, which is coated with a lot of blood that flowed up from his mouth and nose. All that could be from post-mortem body position, but also from being tied upside down as he coughed it out and died. Little overall cyanosis - purple in the lips, anywhere else - could mean no suffocation, or not a lot. Little sign of mucous or foam means the same: a lot of quick damage, a lot of bleeding, a relatively swift suffocation with little struggle (fluids + struggle = foam). At this end of the scale, a chemical death of the type I'm investigating can look like gunshot to the chest, or vice-versa, so the clues aren't the clearest. He also may have red, damaged eyes, some yellow visible inside a nostril, yellow bits in his hair ... a band-shaped bruise on his neck is surely another clue. V3 (purple color?, yellow staining on cheeks? eyes? ) Only a superficial-seeming wound to the forehead to explain the blood seen. Also, this image is very familiar to me for some reason... anyone else happen to know if it was re-used somewhere else? It's app. nowhere in the "Caesar photos" as I had thought. 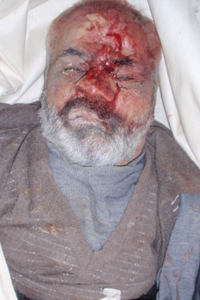 From the VDC entry for Unidentified (see below), a second view takes os from too dim to too bright, and we see the blood comes down under or into his nose and across his upper lip as well. 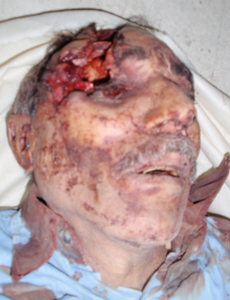 yellow streaks on the forehead … It seems possible he coughed most of this up his face as he died, and then they jabbed a metal fencepost into his forehead too. V4 mild puffy eyes, poss. color and lip issues, at least some blood from the nose, but then he was apparently smashed so it half-flattened and split open. V6 no head, or nothing but the base of it, like a bowl made of skull - what remains of the neck seems mainly stripped of flesh, as if his head was always blown off, and maybe feral dogs had a chance to take some of the remaining. Not much value to sharing the photo here. His hands (the body does appear to be adult male) look extra dirty, which can have a few explanations but suggests some kind of prolonged captivity with poor hygiene, etc. V7 Contested (see below) One eye is fairly red, but not squeezed shut and not swollen - the other eye seems to be gouged out? Blood and thick yellow mucous with brown in it plugged his nose, distorting one nostril - quite purple lips, mild purple in general, but not as much in the forehead? 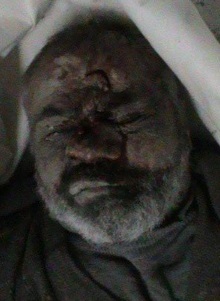 Forehead covered in blood might be just from post-mortem body positioning, not from how he was killed. V2 seemed contested at first. VDC ... unidentified, child-male. 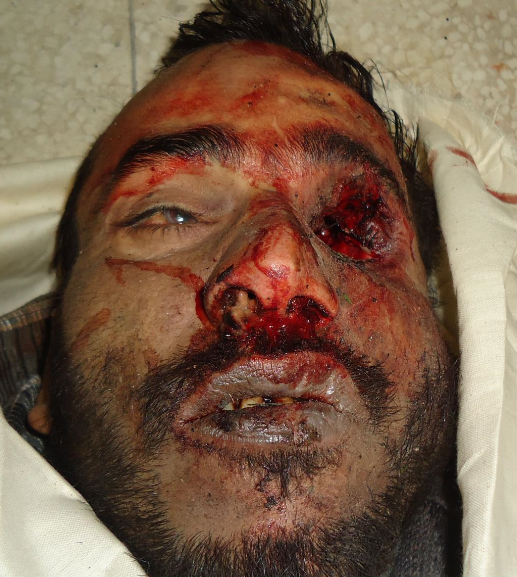 Notes: He was killed in summary execution by regime forces in Ma'azen. Not sure where this is: the Arabic version translates the location as "minarets area" ( منطقة المآذن - mintaqat almadhin ) and brings up nothing on Wikimapia. But CDD says he's "One of the martyrs of the massacre of chemistry unknown identity (5)" this video calls him "Unknown child (13 years (estimate?)) 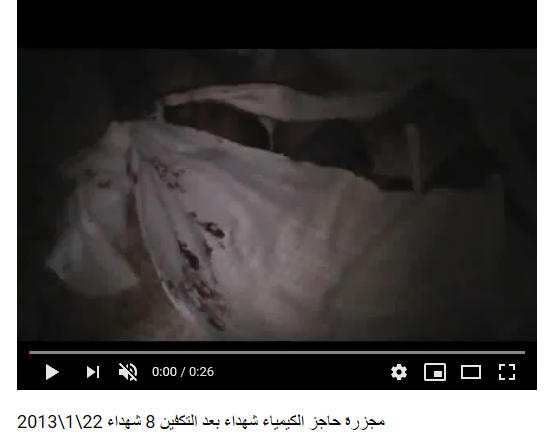 / Damascus countryside - Adra / executed by elements at chemical barrier" And a boy or young man that could only be him is lined up with the others in a dim, blurry, stretched morgue video - comparing the two, it's clear he's included here as well. But it's V7 who seems the odd man out, if anyone. The Douma-based VDC has a somewhat scattered listing), perhaps the 8 listed for Damascus suburbs, field execution, Jan. 28. minus Amer Mohammad Saleem, age 25, civ, Nashabeih, executed on 1-28, with a video to show he's not one of these, nor similar appearance, nor any other clue to link him in. V5 = a match, but not unidentified anymore ... see next section. 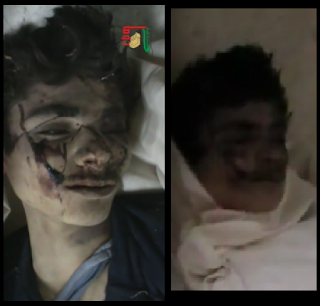 All tend to be from Douma, have martyrdom location (blank), no notes. Not very specific. The VDC acknowledges the death toll is six (2 entries note killed at "Kimiya'a" or "al-Chimia" Checkpoint, along with "five other individuals/persons"). Victim 7 is one with no VDC match, but there are two of those, it seems … and the Civil Defense Douma was clear in calling him "An unidentified martyr at the chemistry barrier on Adra Road." However, morgue videos only show six bodies, and on review, this is the one never seen. 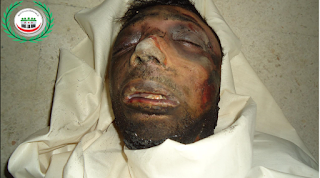 It's possible he was recovered or processed separately from the rest but still belongs... the tiles under his head and other conditions suggest he's with the others at the point of those photos. from Haran Al-Awameed, but martyrdom location: Damascus Suburbs: Meda'a. Cause of Death: Field Execution. Image at right is clearly the same V5 from the "chemistry barrier" Meda'a - in our area, south of Adra al-Balad (Maydaa, circled in red, on the map above). Haran Al-Awameed is 11km south of Meda'a, next to the airport (green box). 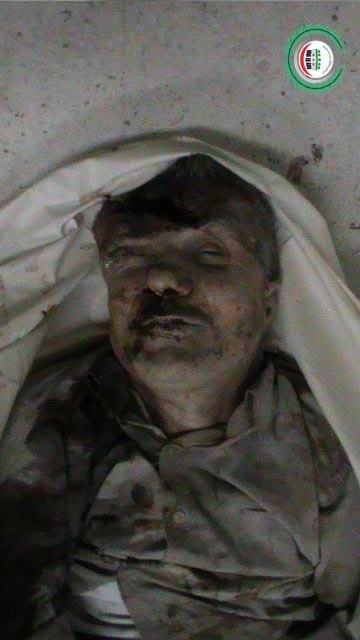 - Husain Ali fr Haran Al-Awameed (no image or clue to which body it might refer to) - "the nickname is not accurately known, he was field executed with five other persons on al-Chimia Checkpoint" Martyrdom location: Damascus Suburbs: Adra. Or, more specifically, Meda'a. - 3 displaced from Haran Awameed killed by "shelling" in Hazzah, 5 March, 2018.
largely burned with fire (likely was face-down, lit from above, on backside, but also around the neck) - prior eye swelling seems likely (one eye now in decay-related swelling? ), and app. thick white mucous in the nostrils. Another Chemistry Barrier Massacre a week earlier?